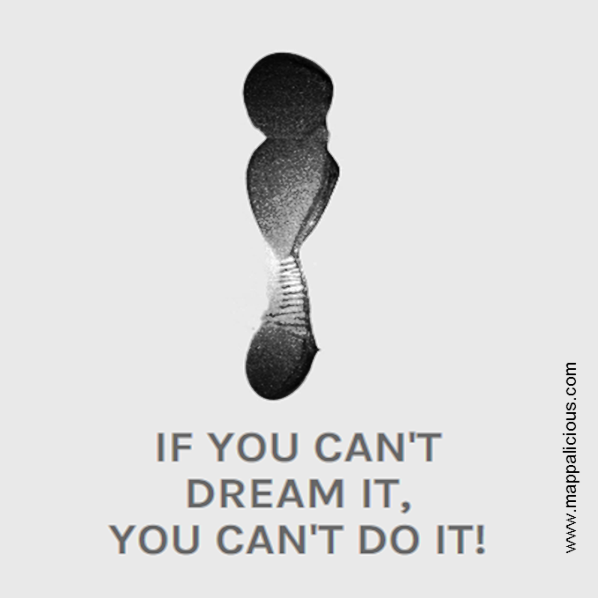 If you can´t dream it, you can´t do it! In a lot of self-help books (of the shallow kind…), you’ll get to read the sentence “If you can dream it, you can do it” – which supposedly has been coined by Walt Disney. I acknowledge that this saying is well-intentioned – yet well intentioned and well done are oftentimes light years apart. There are simply a lot of things which sometimes all of us, and often most of us, cannot do – no matter how strong we believe. However how hard you exercise, you will never run as fast as Usain Bolt. No matter how hard you study, you will never be as smart as Steven Hawking. No matter how hard you work, you´ll never create the next Apple, Google, or Microsoft. Of course, there are always exceptions to the rule. There is a Usain Bolt, there is a Stephen Hawking, and there are Jobs, Brin/Page, and Gates – but they are “singularities”. And no matter how many books sporting titles such as “The 10 Secrets to being like Steve Jobs” you´ll read – there´s a 99.999% likelihood of failure. No man in this world can run a mile (1,609m) in less than four minutes. This has been an unwritten law during the first half of the 20th century. Innumerable athletes had tried to conquer the so-called miracle mile; some came close, but no one was able to beat that time. There even were physicians who claimed the human body per se is not capable of performing that feat. However, impossibility did not know that somebody didn´t give a sh.t about impossibility: Roger Bannister, a young British athlete, just didn´t believe in the widespread doctrine. In a series of preparatory runs, he came closer and closer to reaching the impossible. Finally, at Oxford’s Iffley Road arena, on 6th May 1954, under rather bad external conditions, he finished the mile in 3:59.4 minutes – new world record. * You can watch a race between Bannister and his closest rival at that time, John Landy, a couple of weeks later here. While this is very impressive in itself, it is not the point of the matter. The really fascinating fact is: Suddenly, by the end of 1954, a total of 36 athletes worldwide were able to beat that time. Now what has happened here? Was there a sudden advance in the training methods? Or the doping substances? I don´t believe that. Rather, I believe Roger Bannister has overthrown a collective self-fulfilling prophecy. He broke “the spell”, he crushed the mental blockade that had bedeviled his generation of fellow athletes. Bannister had what psychologist like to call high self-efficacy, the specific belief in one’s ability to succeed in specific situations. High self-efficacy is associated with a wide array of positive outcomes, while a lack of self-efficacy is a good predictor for failure – irrespective of actual capabilities. Low self-efficacy is the psychological equivalent of “If you can´t dream it, you can´t do it”. But no amount of self-efficacy will help us do what´s not doable. * The current world record is held by Hicham El Guerrouj (3:43.13).